This first edition of "Single Best Answer Questions in Cardiothoracic Surgery" provides a comprehensive revision aid to the candidates taking the specialty examination in Cardiothoracic Surgery world-wide. This new revision aid provides over 300 single best answer practice questions in Cardiothoracic Surgery and conforms to the recent changes in the format of specialty examinations in Cardiothoracic Surgery. 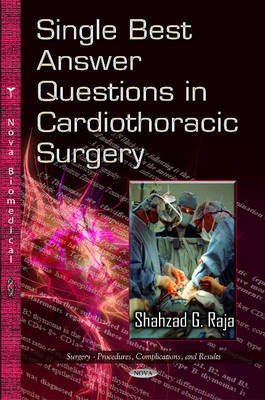 Each question has been carefully formulated to cover an important topic in cardiothoracic surgery. The questions cover the complete specialty examination syllabus and a considerable number of these have been based on previous examination questions. This book contains a substantial number of patient-based questions or clinical vignettes that will enable prospective candidates to test their ability to integrate key basic science concepts with relevant clinical problems. In addition factual recall questions have also been included that probe for basic recall of facts. Detailed and comprehensive explanations, rather than just brief answers, to questions have been provided so that the candidates do not have to consult textbooks for clarification as is the case with most other MCQs books currently available in the market. A list of relevant references is provided at the end of each answer to enable candidates to read the most up to date journal articles on the subject. The questions in this book can be used in a number of ways: (1) as a diagnostic tool (pretest), (2) as a guide and focus for further study, and (3) for self-assessment. The least effective use of these questions is to "study" them by reading them one at a time, and then looking at the correct response. These over 300 practice questions are intended to be an integral part of a well-planned review as well as an isolated resource. If used appropriately, these questions can provide self-assessment information beyond a numeric score. Furthermore, the questions have been planned in such a way that this book can be used as companion to any textbook of Cardiothoracic Surgery.